Steak will give you a heart attack. Eggs will give you a stroke. Fish will give you mercury poisoning. Carbs will give you diabetes. Vegetables and fruits are covered in potentially deadly pesticides. All of the above statements are true... unless they're not. For every statement above, you can cite a study that supports a contrary position. Most supermarkets are set up in the same way. If you walk the outer ring of the market you usually come across the following pattern: Fruits & Vegetables, Meats & Fish, Dairy, the Bakery. Most of your purchases should be from the outer ring. Dip into the aisles only for life giving essentials (i.e., grains, pasta, cookies, coffee and ice cream). Avoid prepared foods. Go for the low sodium option when you can. Today we have a recipe for a side dish. A starch. Yes, a member of that evil, fat-producing, diabetes-inducing Carb gang, none other than that famed middle-eastern food terrorist, couscous. But not just any couscous, I want you to go find Middle Eastern (sometimes called Israeli) couscous. The difference is the size of the pearl of pasta, (and that's essentially what couscous is, a pasta). Middle eastern couscous has a very large pearl. I like it because it gives you a better mouth feel when you're eating it, and it holds its shape better than that sawdust most of us have been sold as couscous. You should be able to find it in either the bulk grain aisle of your market (if it has one), or boxed in the aisle with the rice. I adapted this recipe from a demonstration cooking class I attend at the New York Wine & Culinary Center in Canandaigua, NY. 1 Bell Pepper (red, yellow or orange), diced. Melt half the butter in a small saute pan over medium high heat. When the butter is fully melted add the vegetables and toss. Cook the vegetables until lightly caramelized, approximately 5 minutes. Remove from heat and set aside. As the vegetables are cooking, bring the chicken stock and remaining butter to a boil in a medium sized pot. When the stock boils add the couscous. Stir. Turn down the heat to medium. Pay attention, if you're boiling too rapidly the couscous may bubble over. You want a roiling boil. 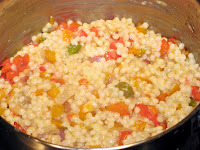 If the couscous starts to boil over temporarily remove from the heat and turn down the burner. Return the couscous to heat. Stir occasionally, cooking until most of the stock has been absorbed, approximately 10 minutes. When the stock has been absorbed, remove from the heat and stir in the sauteed vegetables and the grated parmesan. Serve. Watch your family be amazed. This is a side that is especially good with lamb or chicken. Remember, you can get the pepper and onions from the salad bar. You can also add any other vegetables you'd like: peas, corn, artichoke hearts, whatever strikes you. That's it. See how easy. As always, remember, you can do it. You can cook. The mystery has been solved .. 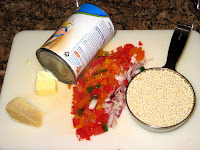 I've been looking for pearly rice & it's not rice at all, but couscous! Publix didn't have it so Whole foods is next. Whole Foods is where I get my Middle Eastern Couscous.